I was really nervous going into this book, I will admit that. 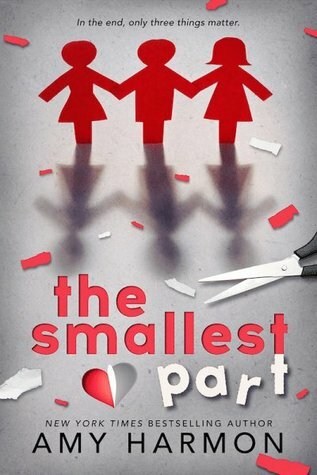 Seeing the cover, the three people, I was just not very excited that Amy Harmon wrote a triangle trope book. I was ready to brave it though. For Amy I would do that. Ya’ll…it is not that. It. Is. Not. That. It is so much more than that and I feel so foolish for even judging Amy’s cover before even experiencing what she has strategically placed for us in these pages. Stupid, stupid, stupid Talon. First I should say this, if you see a book that has Amy Harmon’s name on it: get it. I can guarantee that you will start feeling all sorts of things and you will have no idea on how to make it all stop. I have zero control and a very lose grip on all of my feelings every time I pick up an Amy Harmon book. I’m making that known right now. My favorite thing in The Smallest Part (besides the obvious- past characters) was the way that the past parts of the chapter opened us up to the present parts and somehow, they all fit together. They were joined in a way that we get to experience with Cora, Mercedes, and Noah. The intricate details were so neat to me. It’s the little things like that that make me happy. I didn’t like how a lot of things were left unsolved and unanswered when it came to Cora. I can’t go into much detail but I really wanted to know quite a few things about her and I didn’t ever really get the closure from her presence either. Basically- you can’t lose with an Amy Harmon book. If you are a huge fan of The Law of Moses and The Song of David you are going to love this heart filled book about these three people. I don’t think Amy has told a story quite like this one before and for that I’m thankful. I’m glad she told it with The Smallest Part. If you don’t love what she did, I just don’t know what to say to you.